#PorteOuverte, Instagram algorithms, and Emergent tropes. I got up this morning, did my routine check of feeds, and learnt about the Paris attacks/shootings/explosions/blasts. 1) A few Tweets were sharing snippets and updates from news agencies. 2) More were calling out news agencies for irresponsible reporting and for stirring moral panic with half-formed, speculative, clickbaity, and contradictory reports. 3) Most were encouraging fellow Tweeters not to crowd the hashtags with peripheral information, prayers and opinions, and plain old spammy advertising. Such is the nature of one’s feed when I only follow 164 Tweeters, most of whom are academics and media scholars. I took to Instagram to watch vernacular visuals emerge, as I did with #OccupyCentral, #CharieHedbo, and #JeSuisAhmed. Unlike these earlier case studies, there has not yet been an iconic symbol, an iconic scene, tributes to the dead, or live images of happenings on the ground. However, Instagram’s interface update that now offers related hashtags, “Top Posts”, and “Most Recent” posts has changed the ways in which I received information. Screenshots taken from public Instagram hashtag streams on 14 November 2015, 1100hrs, GMT+10. #ParisShooting was the first hashtag I saw on Twitter. This is what Instagram suggested when I searched the tag. However, #ShootingParis and #ShootingInParis seemed to present photo shoots in Paris. 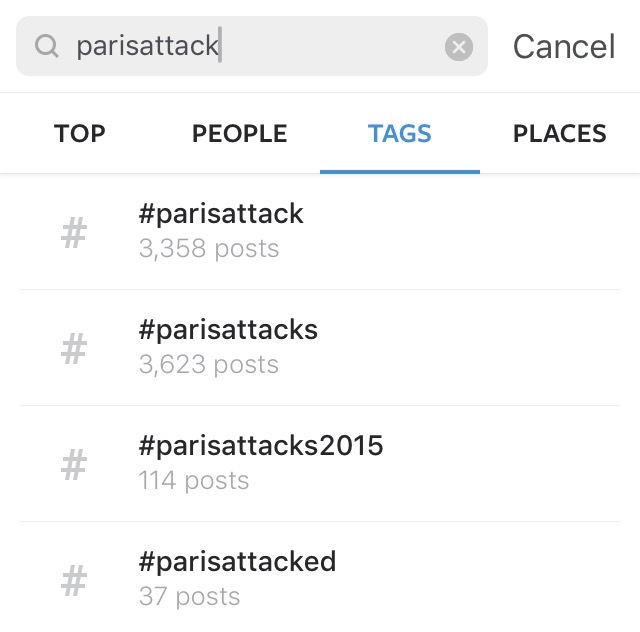 #ParisAttack was the second hashtag I saw on Twitter. This is what Instagram suggested when I searched the tag. 4) And the emergence of a new meme – the peace sign modified to resemble the Effiel Tower. 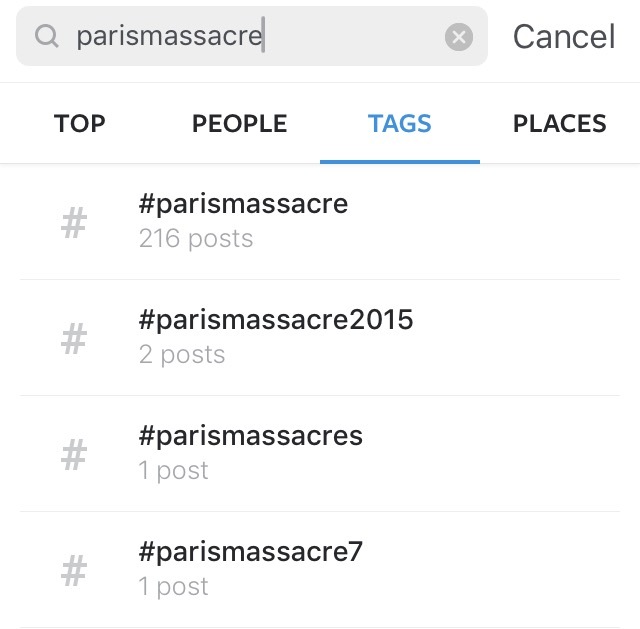 #ParisMassacre was one of the “Related” hashtags Instagram suggested to me. However, clicking on these images revealed that the posts were published in January during the #CharlieHedbo shootings. Also curious is that I have not come across a mainstream news publication/news report that has used the term “massacre” in their coverage. Here are other hashtags suggested to me by Instagram. The Top Posts for #Paris and #PrayForParis presented more tribute art and collages. The Top Posts for #Bataclan (one of the sites of the shootings) and #EaglesOfDeathMetal (the band that was playing in the Bataclan, concert venue at which the shootings occurred) presented some images of tribute and others of concert-goers and the venue pre-shooting. 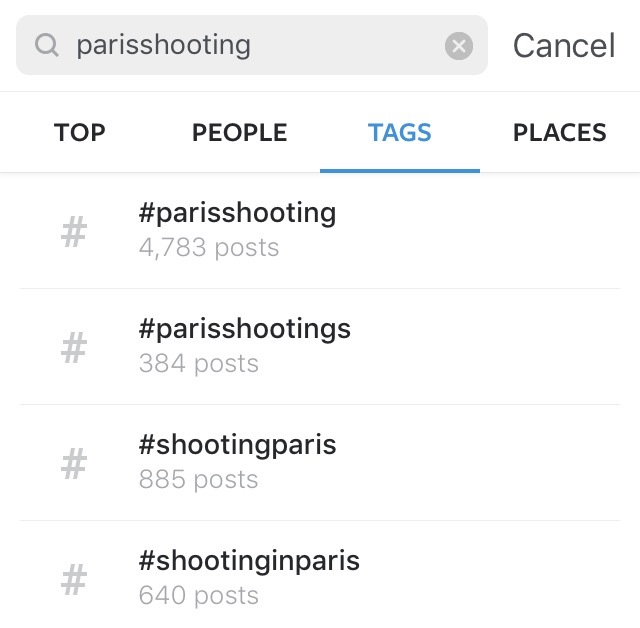 I cannot decipher the Top Posts for #ParisInFlames or how this is related to the incidents. #ParisOuverte is the least used, and is probably a misnomer for the primary hashtag, #PorteOuverte. 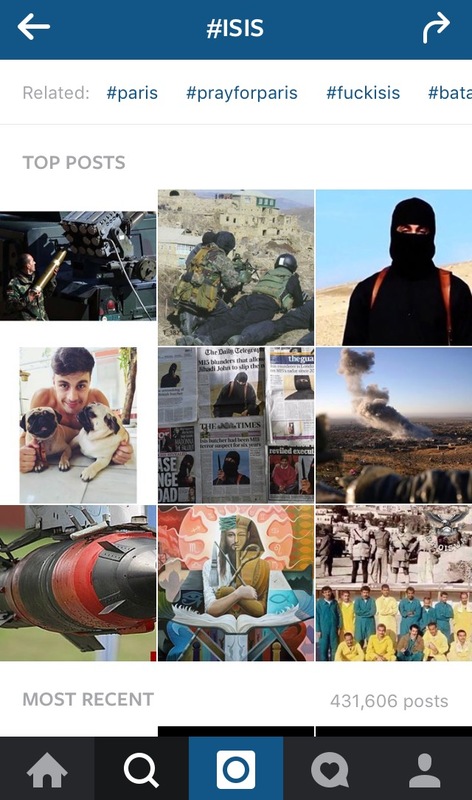 Now, the thing that really annoyed me is that #ISIS was one of the “Related” hashtags Instagram suggested. Well, according to mainstream news reports and chatter on Twitter and Facebook right now (1240hrs GMT+10), we don’t yet know who the attackers are or what their motivations may be. However, anti-Islamic and Islamophobic sentiment is already beginning to emerge by uninformed users on various social media. Instagram’s algorithms are obviously not helping with the situation here. Previous Post I want to be an academic.